Released in 1980, detective film, The Mirror Crack’d, was based on the famous Agatha Christie novel that was written two decades earlier. Featuring an all-star cast, it revolved around Christie’s renowned amateur sleuth, Miss Marple, as she attempted to crack the case of a spate of mysterious deaths in a quaint English village. Set in 1953, the story unfolds in the sleepy hamlet of St Mary Mead, where Miss Jane Marple is one of the residents. The peace is shattered by the arrival of a Hollywood production company, including two famous actresses, who are filming a costume drama about Elizabeth I and Mary, Queen of Scots. The locals are excited, especially when they are invited to a reception hosted by the film company in local stately home, Gossington Hall. However, the thrill of having a film crew in the village soon diminishes after local resident, Heather Babcock, drinks a poisoned cocktail and dies! It soon becomes apparent that the cocktail wasn’t meant for her. The intended victim was film star Marina Rudd, played by the legendary Elizabeth Taylor, who had been chatting to devoted fan Heather when the poisoned drink was consumed. This is the start of a series of suspicious deaths, which soon have Miss Marple’s bloodhound-like nose twitching as she realises there’s a killer in their midst. 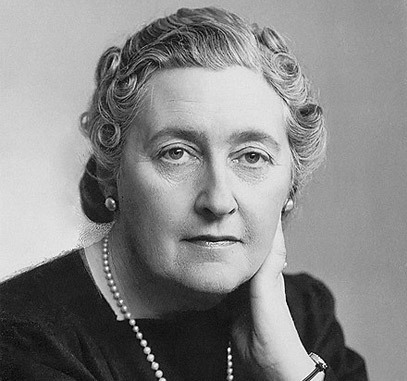 Agatha Christie was already a well-established author when her novel, The Mirror Crack’d from Side to Side, was published in the UK in November 1962. It was released in the United States under the abbreviated title, The Mirror Crack’d. Born in Torquay, Devon, in 1890, the author was renowned for her detective novels and famous sleuths, including Hercule Poirot and Miss Marple. She was the most successful crime writer of all time, having her first book published in 1920 – The Mysterious Affair at Styles, featuring Belgian detective, Poirot. Prior to her first success, Christie had received six rejections from publishers. Following her death in 1976, it was revealed her books were the most widely published in the world, beaten only by Shakespeare’s plays and the Bible. Around 40 of Christie’s novels have been made into movies and have attracted some of the biggest A-list actors on the planet. The Mirror Crack’d was no exception, with a cast list that read like a Hollywood who’s who. Kim Novak starred alongside Elizabeth Taylor as fellow actress and rival, Lola Brewster. Heartthrob Rock Hudson played Marina’s husband, Jason Rudd. Angela Lansbury played Miss Marple in her only outing as the amateur detective. Geraldine Chaplin (daughter of silent film icon Charlie Chaplin) played Ella Zelinsky, Jason’s assistant, while Tony Curtis starred as film producer Marty N Fenn and Edward Fox played Inspector Dermot Craddock (Miss Marple’s nephew). Charles Gray, better known for his role as the villain Blofeld in the James Bond film, Diamonds Are Forever, played the butler and Charles Lloyd-Pack (a familiar face in Hammer Horror films, such as Dracula and The Revenge of Frankenstein) played the vicar. Following Heather’s death, an investigation is launched into how and why her drink was poisoned with cyanide. It turns out Marina has been receiving anonymous death threats, written using letters from newspaper clippings, so it becomes apparent the spiked drink was meant for her. Once on set, Marina believes her cup of coffee has also been poisoned and she goes into a frenzy of terror. Investigating Heather’s demise, Scotland Yard’s Detective Craddock is baffled as to why anyone would want to kill Marina and enlists his aunt’s help. Soon, there’s another victim – Ella Zielinsky, who was the chief suspect prior to being murdered with a poisoned nasal spray substituted for her hay fever medication! She had been secretly in love with Jason and it appeared she would like to see Marina out of the way. Instead, she ended up another poisoning victim herself. Without giving too much away about the twists and turns of the plot, suffice to say it is Miss Marple who works out what’s been going on and the identity of the murderer. The screenplay for the movie was written by Jonathan Hales and Barry Sandler. Director, Guy Hamilton, had admitted he wasn’t a fan of Christie’s novels when he was asked to take on the production, but he was told that was why he was “ideal” for the position. Scenes set in the village of Mary Mead were filmed at Ye Olde George Inn and the bridge on Church Street, Shoreham. Further exterior shots of Mary Mead were filmed around the village of Smarden in Ashford, Kent, including St Michael’s Church. The Thatched House cottage, also in Smarden, portrayed Miss Marple’s cottage in the film. Smarden was considered an ideal filming location, thanks to its traditional thatched houses and village shops. Due to the tight schedule and various locations, the filming of The Mirror Crack’d was no mean feat for EMI Films’ production crew. It was completed on time, thanks to the slick operational skills of the production team in transporting a multitude of equipment around the various locations in the south of England. H&H Van Hire offers van hire for TV, film crews and production companies. We understand that each client has different requirements and we will always endeavour to meet individual needs. Our TV and film crew van hire service includes comprehensive insurance, unlimited mileage and 24-hour roadside assistance. Give us a call on 020 7916 6616 for further information.